Give your backyard celebration the perfect lighting on your lawn or patio with a set of outdoor torches. 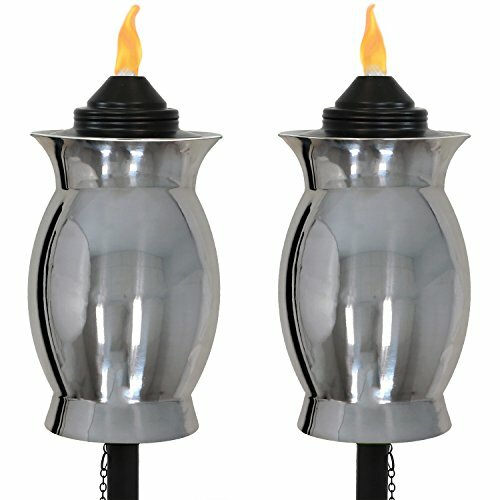 Made of strong stainless steel, these torches are durable and resist rust. They have a slim and sleek design that complements different styles of outdoor decor. Plus, they also include attached black snuffers that allow you to safely put out the flames when you're done using them. These torches can be set up in 3 different ways. You can have them standing upright on the pole in the traditional style. If you set your torches up this way, you can also adjust the height, depending on the number of sections you use when setting up the 4-piece pole. These torches come with deck clamps, so you can mount them on your deck railing. Another option is to use the torches for tabletop lighting on your patio table using just the fuel canisters and decorative shells (please note for safety reasons, the torches should not be lit underneath a patio umbrella or covered shelter).